Telstra is launching commercial Gigabit LTE service is select capital cities across Australia. The gigabit downlink performance is enabled by LTE Advanced features including 4x4 MIMO, 3CA (Three Carrier Aggregation) and higher order modulation (256QAM). Ericsson is a key technology provider for the rollout. At its "Gigabit LTE Experience" event in Sydney, Telstra said that n addition to Gigabit LTE speeds on the downlink, its new network capability also delivers up to double the previous uplink speeds, meaning a peak upload speed of 150 Mbps. On the uplink, Telstra's new network capability uses 64QAM and 2CA (Two Carrier Aggregation) for a peak upload speed of up to 150Mbps. NETGEAR's Nighthawk M1 Mobile Router (MR1100) will first be made available to consumers in Australia in late February, 2017. The device leverages 4x4 MIMO and is equipped with the Qualcomm Snapdragon(TM) X16 LTE modem. Mike Wright, Group Managing Director, Networks, Telstra says: "As the roll out of Gigabit LTE continues, our customers with a Gigabit capable device can enjoy a faster mobile experience for both downloads and uploads. As our customers continue to use increasing amounts of data for entertainment and business use, Telstra's continuous innovation ensures our network is ready to deliver the country's best mobile experience. "Gigabit LTE is also an important step on our journey to 5G and demonstrates Telstra's commitment to delivering Australians a world class network now and into the future. We are well placed to evolve our 4G network and are putting the building blocks in place for Australia to be ready for 5G - this will deliver more bandwidth and lower latencies which are critical for emerging applications such as downloading 4K video, IoT, autonomous vehicles, augmented reality and shared virtual reality," said Wright. Per Narvinger, Vice President Network Systems, Ericsson says: "Once again we are pleased to partner with Telstra to deliver the world's first commercial Gigabit LTE network which we see as an important step as Telstra continues toward 5G. Gigabit LTE provides end users with even faster mobile broadband speeds, further improving their mobile experience while supporting new emerging bandwidth intensive applications. It is exciting to deliver LTE advances that employ LTE carrier aggregation of 60MHz of spectrum with higher order MIMO, and advanced LTE modulation which are all necessary ingredients for Gigabit LTE." Singtel launched 450 Mbps 4G LTE-Advanced service in its home market of Singapore. 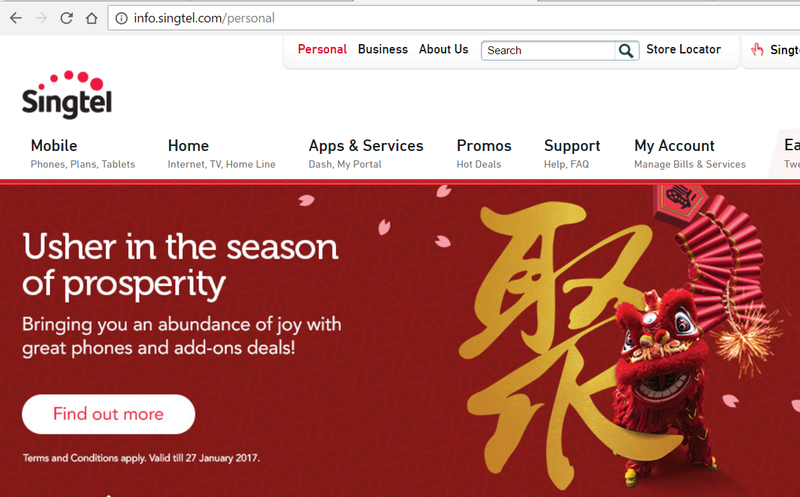 The 450Mbps service is available to all Singtel 4G customers at no additional charge. The first device to support the speed are the Samsung Galaxy S7 and Samsung Galaxy S7 edge. LG V20 users will also be able to harness the higher speeds with a soon-to-be released software update. More compatible smartphone models are expected to be launched by early 2017. “Singtel is investing ahead to deliver faster speeds and wider connections with the steady deployment of innovative technologies on our live network. With more customers consuming and sharing mobile videos, 450Mbps speeds will enable them to download movies in a flash and give them a better entertainment experience while on the go,” stated Mr Yuen Kuan Moon, Chief Executive Officer, Consumer Singapore, Singtel. The boost is made possible by Singtel’s nationwide LTE network upgrade to support 256 Quadrature Amplitude Modulation, or 256 QAM, which increases the number of unique radio waveform shapes to carry up to 33.33% higher data and elevates spectral efficiency. Separately, Singtel and Ericsson have demonstrated download speeds of up to 1Gbps in a live 4G network pilot at two sites in Pasir Ris. This was achieved by deploying 256 QAM downlink, 4x4 Multiple Input Multiple Output (4x4 MIMO) and triple carrier aggregation technologies. 4x4 MIMO doubles the number of data paths between a cellular base station and mobile phones, delivering a speed boost of up to two times normal speeds. Singtel said it plans to progressively rollout 4x4 MIMO technology on its network starting next year to deliver up to 1Gbps speeds at selected high-traffic locations. Supporting mobile devices are expected to be ready by end 2017. 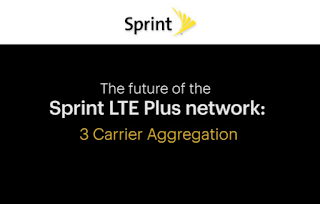 Sprint and Nokia kicked-off the launch of three-channel carrier aggregation in Kansas City’s LTE Plus Network with a live demonstration at Kauffman Stadium just prior to the Royals vs Yankees game. Sprint is hitting peak speeds as high of 230 Mbps using its 2.5Ghz spectrum with three-channel carrier aggregation inside the stadium using the Samsung Note7, Galaxy S7, S7 edge, HTC 10 and LG G5. Nokia supplied its Flexi Multiradio 10 Base Station for LTE TDD, including TD-LTE-Advanced 8-pipe radio (8T8R) that can deliver all three carriers from a single unit on 8T8R configuration for better performance and coverage. Verizon launched LTE Advanced service in 461 cities across the United States. The network upgrade uses carrier aggregation to combine two or three bandwidth channels into one larger channel. Verizon is using a combination of 700 MHz, AWS, and PCS spectrum. Verizon said users should expect 50 percent faster peak speeds when using one of the 39 LTE Advanced-capable phones and tablets already on Verizon’s network – including top-selling Samsung Galaxy S6 and S7 smartphones, Moto Droids and Apple iPhones. There is no additional cost to the user and no customer device update is required. Customers will continue to see typical download speeds of 5 – 12 Mbps, but two-channel carrier aggregation can deliver peak download speeds of up to 225 Mbps. 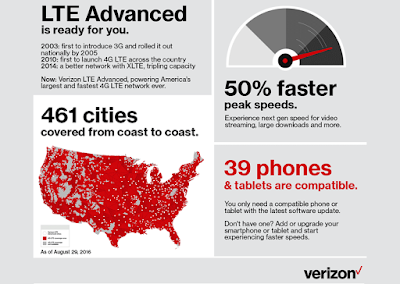 Verizon is also launching a national advertising and social media campaign to support its LTE Advanced rollout. Verizon first launched commercial LTE service in 2010. Ericsson's next Networks Software 16B release will support 1 Gbps LTE user downlink rates and feature "hyper-scalable" radio access network (RAN) architecture. New Elastic RAN will harness interconnected basebands for optimal coordination throughout the network as a foundation in Cloud Radio Access Network (RAN) deployment. Ericsson is also adding to its Radio System portfolio with new microwave backhaul products and new access radios supporting 4x4 MIMO and 256 QAM. Ericsson Lean Carrier, which increases both the data throughput received by end users, and overall system capacity by reducing the interference caused by excess reference signaling across the LTE network. Ericsson’s new Elastic RAN enables every Ericsson Radio System LTE baseband unit to coordinate with any adjacent one, whether in a centralized, distributed or hybrid network architecture using high-performance Ethernet transport networks. 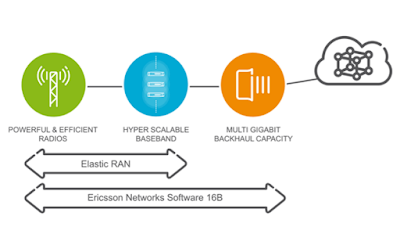 Ericsson said this Elastic RAN approach ensures that capabilities such as Carrier Aggregation (CA) and Coordinated Multipoint (CoMP) can improve the user’s app coverage network wide irrespective of the baseband deployment scenario. MINI-LINK 6651, a compact indoor unit with a link capacity of 1.9 Gbps (using 4096 QAM and a 112 MHz channel), which is used for split mount deployments using an outdoor radio unit. MINI-LINK 6354, a two carrier all outdoor solution for traditional frequency bands, providing a capacity of 2.8 Gbps (using 4096 QAM and 112 MHz channels). Multi-band Booster, which provides a significant boost in performance and improved use of spectrum, by combining a wider high frequency channel with a narrow low frequency channel. One example is bonding of an E-band microwave radio, (70 and 80 GHz) together with a radio using a channel in the 23 GHz to enable 10 times more capacity than 23 GHz alone. "Our latest combination of software, hardware and network architecture innovations supported on the Ericsson Radio System, ensure that our mobile operator customers can continue to delight their customers while driving network performance and efficiency improvements as they evolve to 5G. Gigabit LTE, Elastic RAN, and new radio access and microwave backhaul products are all designed to help our operators become the frontrunners in their markets,” stated Arun Bansal, Senior Vice President and Head of Business Unit Radio, Ericsson. Nokia is preparing to showcase 3D Beamforming, 8x4 Intelligent Beamforming, and carrier aggregation combined with advance modulation at this month's Mobile World Congress in Barcelona. The technologies offer the potential to substantially increase the capacity of both TD-LTE and FDD-LTE networks. TD-LTE-Advanced Pro 3D Beamforming uses Nokia's Intelligent Beamforming capability to maximize signal levels while also minimizing inter-cell interference by combining vertical and horizontal beamforming. It promises 4-fold uplink and 3-fold downlink throughput gains, measured in outdoor field environments using a commercial base station and devices . Nokia's unique Inter-Site Carrier Aggregation combines TDD and FDD carriers from different base stations located at different sites. This can provide high throughput at the cell edge using existing Release 10 devices. Nokia Intelligent Beamforming now includes 8x4 (8 transmit and 4 receive antennas) capability for TD-LTE that doubles cell edge rates and delivers 50% more average sector throughput. It also implements DL-CoMP (Coordinated MultiPoint) for a 50% increase in cell edge spectral efficiency. The Intelligent Beamforming capabilities are particularly useful with high bands for greater coverage and capacity. Uplink Carrier Aggregation and 64QAM modulation are introduced via software and combined to increase peak data rates in FDD-LTE cells by up to 150 Mbps, three times the maximum uplink speed of typical LTE networks today. This rebalances users' uplink and downlink experiences, following multiple downlink speed increases in LTE-Advanced in recent years. "In addition to providing the most high-performing FDD-LTE and TD-LTE networks today, Nokia is also rapidly developing LTE-Advanced Pro technologies with operators. Nokia's 3D Beamforming, for downlink and uplink, is an early innovation and has been field tested in Hangzhou, China. We are also responding to the need for more capacity by enabling comprehensive aggregation of TDD and FDD LTE networks. With Nokia, operators can be assured that our solutions are field-proven and future-proof," stated Tero Peltola, head of FDD and TDD LTE Product Management at Nokia. Cosmote Greece achieved download speeds of 500Mbps in a live LTE network using equipment from Ericsson. Cosmote is implementing FDD 3xCarrier Aggregation & 256 QAM innovation to their commercial network, boosting performance and market differentiation. The demonstration, which took place at the Infocom World 2015 event in Athens on November 24, 2015, used Ericsson’s radio solutions and Ericsson Networks Software 16A . In addition, three component 20+20+10MHz FDD LTE carrier aggregation in combination with 256 QAM modulation deployed in a live network for the first time in the European market. Ericsson said its 256QAM downlink encoding technology provides up to 33 percent higher downlink throughput in good radio conditions. This enables more efficient use of the spectrum allocated to a cell, as well as a 33 percent increase in maximum user downlink throughput. "OTE Group brings the future of telecommunications today. We invest in innovation in order to be the first to offer our customers pioneering fixed and mobile telecommunications services, while we continue to assertively expand our New Generation Networks and develop the country’s infrastructure. With the consecutive 'firsts' achieved by the OTE Group, such as the demonstration of speeds up to 500 Mbps via our 4G+ network, we confirm our technological superiority and make a difference for our customers," stated Stefanos Theocharopoulos, Chief Technology & Operations Officer, OTE Group. 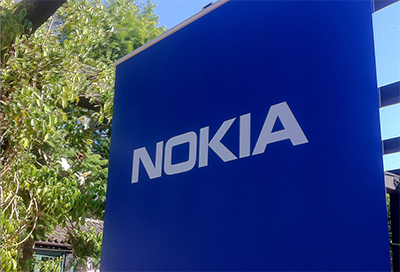 China Mobile has awarded a contract to Nokia Networks to deploy one million TD-LTE base stations by the end of 2015. The contract further expands its TD-LTE footprint with deployment of Flexi Multiradio 10 Base Stations across the country, supporting 18 provinces and mega cities including Beijing, Guangdong and Shanghai. 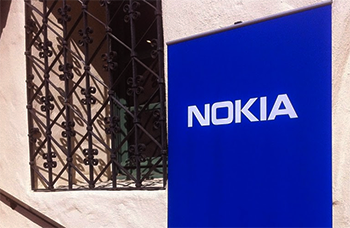 Nokia Networks is now the largest non-Chinese vendor. The new deal marks the third phase of an ongoing TD-LTE deployment with China Mobile and another milestone in the successful co-operation between the two companies. Telstra announced the world’s first 4G LTE Advanced Category 11 (Cat 11) 600 Mbps capable deployment on a commercial network. The announcement was made in partnership with NETGEAR, Ericsson and Qualcomm. Specifically,the Telstra Mobile Network will now support a new WiFi 4GX Advanced III Mobile Broadband Hotspot featuring 3 band Carrier Aggregation technology. The new Telstra Wi-Fi 4GX Advanced III mobile hotspot supports up to 15 WiFi-enabled devices simultaneously. The announcement comes one month after the launch of the first Cat 9 (450 Mbps) devices on the Telstra Mobile Network. Swisscom has tested an LTE-Advanced three-carrier aggregation solution combining LTE in both FDD and TDD modes. The demonstration used three carriers in two bands in a radio access network and used commercial-grade chipsets. The Swiss operator deployed the solution on August 18, 2015 in a Swisscom shop in Zurich and connected to its live, commercial network. Two LTE TDD carriers, each with 20 MHz bandwidth in the 2.6 GHz frequency band (B41), and one LTE FDD carrier with 15 MHz in the 2.1 GHz band (B1) were used. The live demonstration in Zurich was supported by Ericsson Radio Access Network software 15B and hardware as well as by Qualcomm's Snapdragon X12 LTE modem. Swisscom plans to roll out this solution to subscribers in Swiss metropolitan areas by summer 2016 to coincide with three-carrier FDD/TDD smartphone availability. Ericsson said the combination of the three carriers in FDD-LTE and TDD-LTE will significantly enhance the future capacity of the network. The new technology will allow more users to benefit from peak data rates for downloads and uploads when using mobile internet, entertainment or enterprise services. In this specific set-up, a maximum 335 Mbps in the downlink was achieved. part of future radio access, according to a new white paper published by Ericsson. Licensed assisted access (LAA) -- which used unlicense spectrum to boost overall LTE network capacity. LAA targets operator-deployed small cells in the 5GHz band. Initially, it will support downlink traffic although a later extension is planned for uplink traffic. 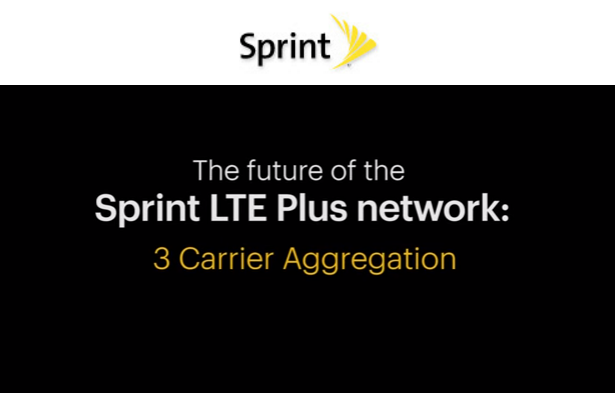 Carrier-aggregation enhancements -up to 32 carriers in both the uplink and downlink, compared to five with LTE Release 10. Multi-antenna enhancements - two-dimensional base station antenna arrays with up to 64 antenna ports are being studied for exploitation of both the azimuth and elevation domain. The Ericsson white paper also touches on machine-to-machine use case for LTE. 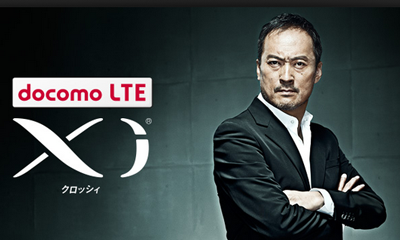 NTT DOCOMO is preparing to launch LTE-Advanced service in Japan on March 27. The carrier announced top downlink speeds of 225 Mbps with top uplink speeds of 50 Mbps. The LTE-Advanced service will leverage the company's Advanced C-RAN network architecture, which optimized radio capacity and maximum transmission speed simultaneously, especially in high-traffic areas. DOCOMO said the use of carrier aggregation technology will enable it to push the LTE-Advanced to achieve maximum downlinks of 300Mbps towards the end of the next fiscal year ending in March 2016. The carrier is aiming for 5G services in 2020. The DOCOMO LTE-Advanced network will launch initially in 22 prefectures, including Tokyo, Nagoya and Osaka. Nationwide availability is expected by March 2016. Two DOCOMO mobile Wi-Fi routers will be available for the service—the Wi-Fi STATION HW-02G, which is now on the market, and the L-01G, which is scheduled to launch in March. DOCOMO is also preparing to expand its lineup of compatible smartphones soon. Earlier this month, NTT DOCOMO has achieved 240 Mbps downlink performance using 35MHz of bandwidth in a live field trial of Advanced C-RAN technology. Advanced C-RAN leverages carrier aggregation (CA) technology to enable users to receive data simultaneously over small cells for localized coverage deployed in congested areas, and macro cells that provide wider area coverage. The carrier said Advanced C-RAN will prove especially useful for improving radio capacity and transmission speed in train stations, large-scale commercial facilities and other high-traffic areas. A previous verification trial last November used category-6 mobile devices capable of download speeds up to 300Mbps in the Yokosuka area of Kanagawa Prefecture, south of Tokyo. "Advanced C-RAN represents an important contribution to the evolution of LTE and will be a key technology for the realization of 5G in the future," said Seizo Onoe, DOCOMO's Executive Vice President and Chief Technology Officer. A total of 360 operators have commercially launched LTE networks and service in 124 countries, according to GSA (Global mobile Suppliers Association). Ericsson will support License Assisted Access (LAA) capability in its small cells starting in fourth quarter 2015. This will enable carrier aggregation of licensed with unlicensed bands to effectively address growth in indoor data traffic. T-Mobile US has agreed to trial the technology. LAA capability will be supported in the Ericsson Radio Dot System for medium and large buildings and the Ericsson RBS 6402 Indoor Picocell for smaller buildings under 50,000 square feet. 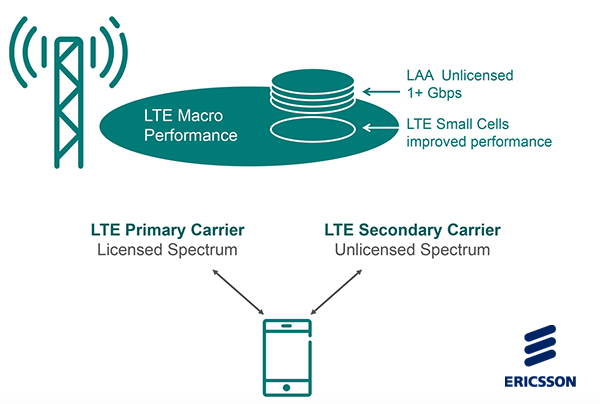 LAA is an LTE-Advanced technology that can improve mobile data speeds and reduce congestion. Ericsson calculates that using only 4 percent of the 5 GHz band, LAA can provide up to a 150 Mbps speed increase to smartphone users. Each additional 4 percent of available spectrum used will increase the smartphone data speed further. Ericsson LAA also incorporates fair sharing within the 5 GHz band, to accommodate traditional Wi-Fi users. Fair sharing works on the principle that Wi-Fi and LAA users would have equal access to the spectrum. "One of the great things about LAA is its 'rising tide' effect, increasing system capacity and making way for better service to all users in the area, whether they have an LAA-enabled device, or are using Wi-Fi or cellular access," stated Thomas Norén, Vice President, Head of Radio Product Management, Ericsson. "With our LTE footprint now covering 264 million Americans, we look to innovations like License Assisted Access to help us drive an even better, more differentiated wireless experience. There's approximately 550 MHz of underutilized spectrum in the 5 GHz Unlicensed National Information Infrastructure (UNII) band and LAA is one of the technologies we plan to develop and use in our continuing efforts to provide our customers with superior network performance. We are excited to be working with major infrastructure partners, like Ericsson, to bring this technology to our customers in the near-future," said Neville Ray, Chief Technical Officer, T-Mobile US. Sonera is delivering peak downlink rates of up to 230 Mbps in certain areas of Helsinki over its commercial LTE-Advanced (LTE-A) network, with a theoretical top speeds of 300 Mbps. The network aggregates a total bandwidth of up to 40 MHz using the 1800 MHz and 2600 MHz frequency bands. Sonera offers Samsung Galaxy Alpha and Samsung Galaxy Note 4 smartphones to use LTE-A and new devices are being added to the portfolio at the beginning of 2015. Nokia Networks delivered the network upgrade. 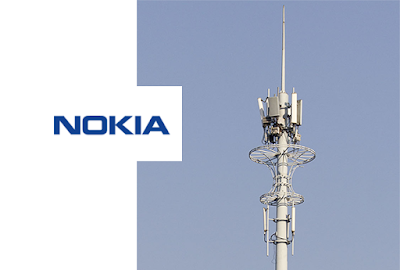 The agreement includes systems integration services and Nokia’s Flexi Multiradio 10 Base Station. 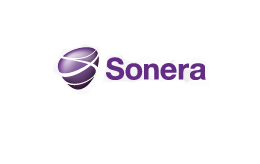 Sonera first launched LTE service in Helsinki in November 2010. Orange has conducted a live LTE-Advanced FDD trial using the 3.4-3.6 GHz (3.5 GHz) frequencies. 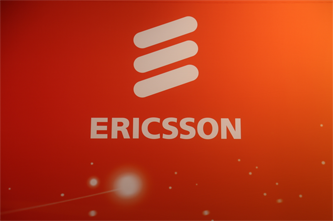 The tests, which were conducted with Ericsson, were carried out in October-November 2014 on Orange's network in Bordeaux using Ericsson's pre-commercial equipment. The companies said the testing established that 3.5 GHz is suitable for the deployment of macro-cells in FDD mode in cities. The first phase of the trial was performed at the Orange Labs in Paris. In this trial, speeds of 300 Mbps were achieved by using the 3.5 GHz band in aggregation with the 2.6 GHz band, thereby confirming the potential of 3.5 GHz FDD technology to increase mobile broadband capacity. The second phase was carried out on Orange's live mobile network and was based on Ericsson's pre-commercial FDD 3.5 GHz radio base station equipment. For the trial, new antennas supporting the 3.5 GHz band were installed at the Le Ponant and Meriadeck sites in the city center of Bordeaux. A range of streaming-based services were tested allowing the team to continuously monitor network performance between the base station and the mobile prototype throughout the live trial. The data throughputs acquired during the tests were measured, both before and after carrier aggregation of the two bands. A peak performance of 150 Mbps at a distance of up to 700 meters was achieved in the 3.5 GHz band when used alone, and speeds of 300 Mbps was attained when used in aggregation with the 2.6 GHz band. "This live FDD trial demonstrated that the 3.5 GHz band can be successfully used in urban and suburban environments in stand-alone mode or in aggregation with another band to provide advanced mobile broadband services using a FDD access scheme for high peak data rate applications to enhance user experience," said Alain Maloberti, Senior Vice President, Orange Labs Networks. Nokia Networks and Saudi Telecom Company (STC) demonstrated TDD-FDD Carrier Aggregation using a commercial chipset. The demonstration was carried out using a new band combination of FDD 1800 MHz and TDD 2300 MHz. Nokia Networks said high frequency bands have limited uplink coverage, but operators can significantly extend TDD coverage with TDD-FDD carrier aggregation with no additional changes to the network. Load balancing between TDD- and FDD-LTE networks ensures the best coverage and speed for all subscribers in both networks.